Searching for a sophisticated getaway where you'll rub shoulders with the elite? Then East Hampton on Long Island, New York is the place for you. This small beachy town is a great place to unwind and tend to your seaside garden — but summer monthly rental prices at the oh-so-common mega-mansions can soar into the six figures. During the day, lounge on some of the island's choice beaches and grab lunch at Bostwick's Chowder House for some laid-back service and delicious seafood served on paper plates that attract celebrities like Alec Baldwin and Jimmy Fallon. Soak up some culture at Longhouse Reserve, a 16-acre sculpture garden featuring pieces from Buckminster Fuller, Yoko Ono, and Willem de Kooning. End the day by snagging a dinner reservation at Nick & Toni's, East Hampton's celebrity haven, which still maintains its family restaurant vibe to make sure its customers feel at home, no matter their status. If an A-List food and wine experience is what you're after, Yountville has got you covered. Nestled in the heart of Napa Valley, this culinary uptopia has more Michelin stars per capita than anywhere else in North America. The California wine country here can hold its own against France and Italy for its highly-regarded wines, so be sure to make a trip to one of the premier vineyards such as Domaine Chandon. Grab a glass of bubbly on the patio and take in the beautiful rolling hills covered in lush grape vines. The town is also known for its lively art scene, so take a stroll along the art walk, or see a show at the year-round performing arts theater. For the most inspiring dining experience in Napa, snag a reservation at French Laundry for an award-winning tasting menu that changes daily featuring fresh ingredients that are never repeated. Though located in a charming and understated little cottage, expect to pay a few hundred dollars for your meal — and that's before the wine! Finally, treat yourself to some pampering at The Spa at the Estate. Surrounded by soothing waterfalls and tranquil reflecting pools, relax and rejuvenate at this intimate oasis as you book a Bergamot and Jasmine Foam Bath and feast on champagne and caviar. As the most glamorous city in Utah, Park City strikes the perfect balance between luxury and comfort. Roughly 30 minutes from Salt Lake City's airport, this historic mining town has plenty to do, no matter what season you choose to visit. Saunter bustling and picturesque Main Street and grab a bite to eat at River Horse on Main: the town's award-winning restaurant known for its seasonal dishes, live music, and a trendy vibe. If fresh powder and skiing is something you crave, the winters here are perfect — home to the 2002 Olympics with 426 downhill trails across 9,326 acres. Come summer, these trails turn into a mecca for those who like to hike, camp, and fish. For a truly A-List experience, come for the ten-day Sundance Film Festival to see some of the most innovative storytellers in the film industry. Some of Hollywood's biggest names brave the cold for lavish parties, luncheons, and panels every year. When you think of Miami, you can't help but picture white sandy beaches, lavish clubs, and expensive taste. 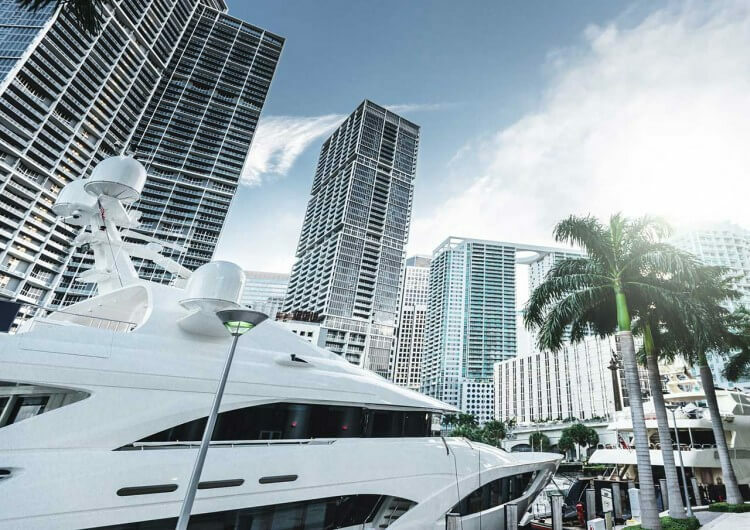 Whether you want to charter a yacht or treat yourself to the VIP treatment at some of the hottest night clubs, there are plenty of things to do that will make you feel like a socialite. Book a suite at the famed Delano Hotel, situated near the heart of South Beach, and you'll feel like you've stepped out of the pages of a glossy magazine. This hotel is known for its modern glamour, popular pool parties, direct beach access, and high-end clientele. Spend the afternoon browsing at Bal Harbour Shops, one of America's most elite shopping centers, filled with countless high-end stores like Prada, Chanel, Harry Winston, Gucci, and more. Prime 112, a see-and-be-seen steakhouse, is the epicenter of all things luxury when it comes to restaurants in Miami. Dine like a celebrity and order the Japanese A5 Kobe Filet, which has been known to cost upwards $700, for a dinner you won't forget. For a truly Miami experience, finish the day by hitting up one of the city's most exclusive clubs — LIV at the Fountainbleau Miami Beach hotel. Splurge on a table for VIP bottle service, surrounded by some of the world's most beautiful people. This tiny five-mile island off Georgia's coast is an elegant getaway that will make you feel like you have stepped right into Gone with the Wind. With a year-round population of only 400, Sea Island has been a vacation playground for some of the wealthiest people in America since 1926, when an automobile tycoon opened the stately Cloister Hotel (which is the only resort in the world to have received four Forbes Five-Star awards for 10 consecutive years). Two years after the hotel opening, President Calvin Coolidge planted the first commemorative oak tree, hundreds of which now dot the landscape. Since then, various politicians have also sought out this southern oasis including former U.S. Presidents Dwight D. Eisenhower, Gerald Ford, George W. Bush, and Bill Clinton. Treat yourself to a private beach, an exclusive Yacht Club, and three championship golf courses. End the night with the ultimate culinary experience at Georgian Room for a five-star meal and quaint garden views. Enjoy dishes like chilled lobster, truffle soup, and wagyu beef — all with custom wine pairings. Jackson Hole has become a desirable luxurious retreat in recent years favored by celebrities, politicians, and foreign dignitaries alike. This ranching town sticks to its cowboy roots, but with a glamorous side that attracts those who are looking to get away from it all. With Grand Teton National Park and Yellowstone National Park just to the north, and protected national forests for miles in all other directions, this expansive valley is an outdoor adventurer's paradise all year round. The scenery here is so spectacular that when the U.S. Voyager II spacecraft launched in 1977, it included an Ansel Adams photograph of the Tetons and Snake River to showcase life on Earth in case the vessel was discovered by extraterrestrial beings. Book a stay at the rustic chic Amangani for unparalleled service, elegance, and views of the Tetons from every room. The building was designed with natural materials so that it blends in with its wild surroundings to give guests a feeling of serenity. If you are looking for something to eat, head over to Snake River Grill, a local fine-dining establishment that has been revered for more than 20 years. Order the steak tartare pizza with house-made garlic aioli and capers — this dish is so well-loved that is has been on the menu for 15 years and will make your taste buds come alive. With world-famous beaches, beautiful weather, and secluded retreats, it's no wonder that the glitterati choose Maui as their island getaway. Try experiencing the island in a unique way and explore the natural beauty and essence of Hawaii from the air. Charter a helicopter and explore deep valleys, cascading waterfalls, miles and miles of pristine beaches, the dormant volcano in Haleakala National Park, lush rainforests, and more from a perspectivce you just can't get from the ground. Spend the afternoon practicing your backswing at the Plantation Course at Kapalua Golf, consistently recognized as Hawaii's #1 course and home to PGA TOUR's Tournament of Champions. Practically every hole here has dramatic ocean views that may throw off your game when you can't look away. For a swoon-worthy, yet pricey meal, head to Mama's Fish House, which send out daily for freshly caught, multi-colored Mahi-mahi, tropical Ono, deep-sea Ahi, and more. The fish is served so fresh that the fisherman who reeled in your meal is listed on the daily menu. By the end of your trip here you will feel so relaxed and refreshed that all your troubles will have seemed to melt away.